A game with crayons? Aren’t I too old for crayons? Today on Boards & Barley I’m reviewing a classic game called Empire Builder! Empire Builder is a “crayon rails” game where players try to build a network between cities such that they can deliver the goods that those cities desire. Hold your horses there big fella… did you say “Crayon” rails? Yes I sure did, kind sir. The Crayon Rail System is a subcategory of Route/Network Building. Types of these games use crayon or other non-permanent methods of making connecting lines on a board, often eraseable. The most popular Crayon Rail games are part of the Empire Builder system. The way this game is played allows players to actually draw (as in, use a crayon to draw on the board, not as in draw a card) their train connection routes onto the game board. On your turn you will first move your “train” pawn up to the number of spaces allowed by the type of engine you control. Once you’ve moved your pawn you can then pay to add train tracks to your network. The objective of the game is to connect 6 of the 7 major cities and possess $250 million. The first player to get to that point wins. So how do you get money? Players each have three cards. On each card are three demands. Each demand lists a city and a resource that they want. It also lists the money that city will pay if you can drop off that resource to them. Throughout the game players will be picking up resources in one city and then delivering them to another city. Each delivery gets them some cash. The tricky part of the game is to know when the best time is to start focusing on income rather than network building. I’ve played this game about 15 times and would play it again tonight if the circumstance arose. It is a very simple game to learn in terms of mechanics. But the satisfaction one gets from fulfilling an demand on one of their cards is great! Notice the crayons? It’s time to color! GAME PLAY: This game is fundamentally simple to play. It is easy enough to teach to non-gamers and those I’ve taught really seem to enjoy it. There are not any hugely daunting decisions in the game that would turn people off. STRATEGY: I love the strategy in this game. Players have to attempt to balance building a larger network with delivering the most appropriate goods. My favorite is when I can fulfill two demand cards in the same city on the same turn! THEME: So some people are sick of train games. That’s fine. This isn’t as much a train game as it is a network game. That’s why the theme can work almost anywhere. There are versions of this game with maps from Australia, China, Japan, Britain, the Moon, Mars, and more! Choose your geography and start networking! COMPONENTS: Each of the resources has a stack of three or four tiny poker chips. These can really get fiddly. And the worst part is when you accidentally knock the box over. Empire Builder is one of the few games that I make certain to never set on its side! TIME: Beware… with 6 players this might be the only game to hit the table at a game night. It can take a long time to play since there are a lot of decisions that can’t be addressed until you draw a new demand card. I would almost recommend to keep this to 2 or 3 players. ARTWORK: I understand that the board needs to be white so everyone can see what color tracks people are drawing on the board. That doesn’t mean I have to like it. The artwork is one of the worst parts of the game for me. This game has been around for a very long time (since 1980). It seems to be very well designed and I am tempted to not change anything about the game. But since this portion of the column exists I might as well make a suggestion. I would like to see different scenarios in the game including different victory conditions. Sometimes a 6 City/$250 million game can take a long time. If there were setup or start game scenarios that could guide players decisions it could make for quicker game play with less downtime. If you think this start game scenario idea would be good, check out Empire Express! This game can tend to roll on and on. I recommend a nice beer to sip on. 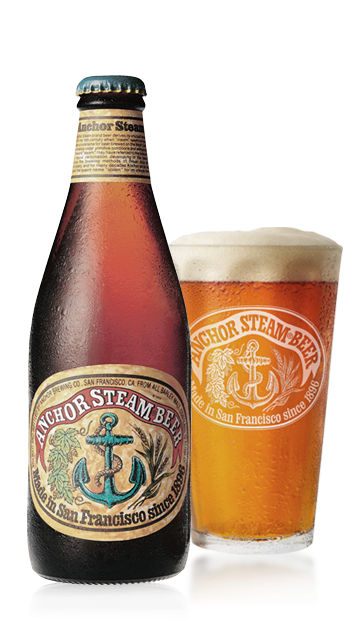 One I particularly enjoy for a game like this is Anchor Steam by the Anchor Steam Brewing Company. It also helps that this is a very “American” beer and you’re building your network across the good old US of A (unless you’re playing British Rails, Lunar Rails, Martian Rails, Australian Rails, China Rails, I think you get the point). A not-too-heavy, not-too-light beer is perfect for Empire Builder! Posted on April 4, 2013, in Board Game Reviews, The Boards and tagged BGR, board game review, designer perspective, empire builder, preferred beer pairing, rail games, rating. Bookmark the permalink. Leave a comment.